Salesforce gives you the ability to organize Salesforce related lists on each object to your liking. By going to Setup | Personal Setup | My Personal Information | Change My Display (picture below), you can select an object and then choose the Salesforce related lists you want to display and in what order they display. Salesforce also allows you to personalize all objects and Salesforce related lists you have access to. 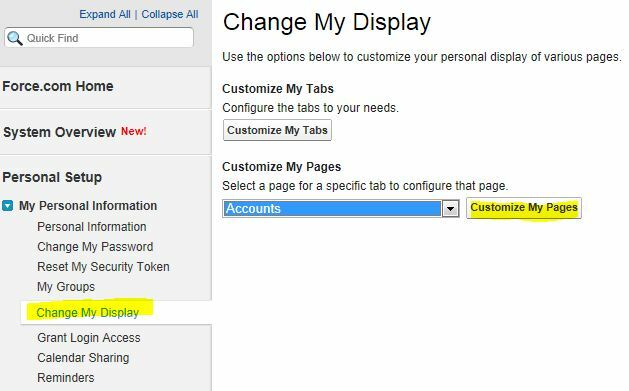 These personalization settings will stay set until you change them or an administrator overrides them. Use this to your advantage to make Salesforce fit your needs instead of wading through all the related lists to find the information you need. We can take this a step further by using collapsible sections on the page layout. You can hide the fields in any section that has a triangle next to it (picture below). This allows you to keep your detail page clean but still have access to the hidden fields when needed. When you hide a section, it is hidden for all records of that object with the exception of some Visualforce sections that have dynamic content. They may open again the next time you view a record.